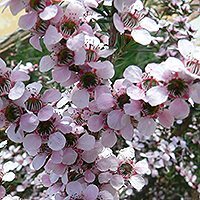 A number of species of Leptospermum are worth considering in landscaping. They not only produce wonderful flowers, they also make great screening plants and of course are sought after by apiarists for the medicinal honey industry. It is the plants that we commonly call Tea Tree that include the Leptospermums. Wonderful flowering plants with a number of garden and landscaping uses. The species have been used for many years as screening plants and hedges. With hybridisation it is the new free flowering cultivars that are sought after by gardeners and landscapers alike. Flower colours vary from white to pink with some red flowers as well. Species include Leptospermum scoparium, lanigerum laevigatum and petersonii. Leptospemum plants range from shrubs to small trees. Hybrid cultivars such as Leptospermum ‘Pink Cascade’ have masses of flowers in Autumn through to Winter and are valued as garden plants for the winter color they provide. Leptospermum or ‘Tea Tree’ are found across Australia and also in New Zealand, and as such with over 80 species much variation exists. In general most species make good screening plants and have attractive flowers. In cultivation L. scoparium is common, however many of the hybrids have been developed in New Zealand. L. scoparium ‘Red Damask with dark red flowers is a hybrid that is most attractive, however this one was bred in California. L. continentale is known as the ‘juniper tea tree’ and L. lanigerum as the ‘woolly tea tree’. L. polygalifolium ‘Little Bun’ is a nice small growing form. L. sericeum or ‘silver tea tree’ has attractive silvery foliage. Try looking for Leptospermum ‘Pageant’ with its nice purple flowers or Leptospermum ‘Rudolph’ with large red flowers. Leptospermum ‘Pink Cascade’ pictured right is another with great flowers.